I'm horrible about taking belly pics. Even with Jack I always forgot, so Baby Insomnia has really gotten neglected. We are now officially a little over halfway there!! Baby's Gender: It's a BOY!! I'm feeling: Pretty good! 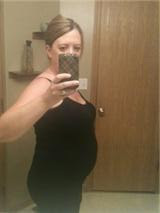 I have been getting really bad Sciatica this pregnancy, a lot worse than with Jack. It's most noticeable when I'm working and trying to sleep. Other than that I feel pretty good and, knock on wood, everything is on the up and up! Cravings: Buffalo Chicken Anything. And carbs. Lots of carbs. What I miss: A nice cold beer on a hot day. As a bartender, I poor cool libations for people all day. Sometimes I really miss being able to have a drink of my own. I also miss being able to paint my own toenails. What I love: Baby Insomnia's little kicks and punches which are becoming much more frequent and pronounced. Especially when I drink cold water or have a bowl of ice cream for dessert! I'm writing this post on the fly, so if I've left anything out, feel free to ask away!